KS Engineers, P.C. (KSE) provided base survey control, Low and High Altitude Aerial Photogrammetric Mapping capable of providing 1” = 20’ design plans, and Ortho Photography, of an 1,800-foot band width centered along the track right-of-way, and High Definition (HD) High-Rail Laser Scanning to produce detailed LIDAR images of the tunnels. The assignment included SEPTA Railroad facilities for approximately 130 rightof- way miles. Using GPS in Static mode, First Order Geodetic Monuments, and the Continuously Operating Reference Station (CORS) network, KSE established a systemwide horizontal and vertical GPS control network and located approximately 430 photo picture points to control the mapping effort. 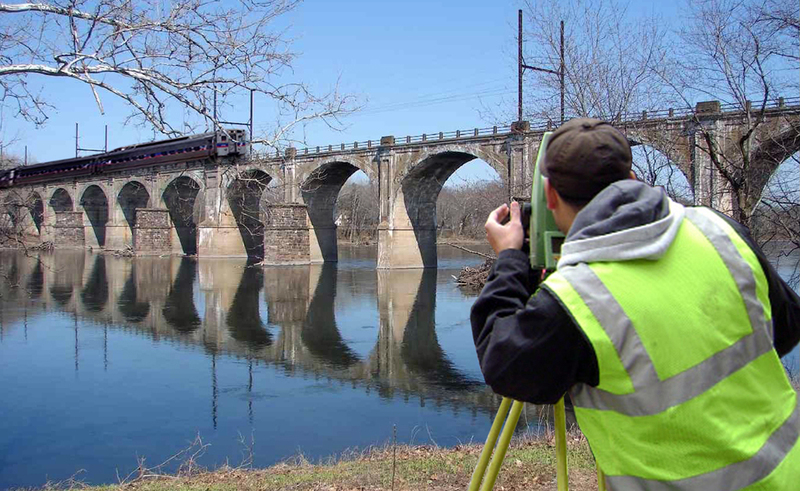 Conventional horizontal and vertical control was developed through the tunnels to control the High Definition (HD) High-Rail Laser Scanning and mapping effort. This mapping base will be utilized for the design of a systemwide Positive Train Control (PTC) monitoring system which will prevent train collisions by automatically activating the trains’ braking systems, thereby preventing trains from colliding.